Look, this isn’t some moral stand against indiscriminately deep-frying vegetables and other foodstuffs. Rather, it’s just an inclination I have that when I’m in a new place, I want to discover new things—things that aren’t normally available to me during my humdrum, nine-to-five existence in my hometown zip code. And that includes eating at places you won’t find on every other major thoroughfare across this land of ours. Kansas City, Here I Come: Tap on one of the 50 featured cities in LocalEats, and you’ve got an alphabetical listing of the top restaurants in that town. There is a downside to my “Only Local Eateries Need Apply” stance to eating on the road: It is awfully difficult to know where to find good local eateries when you are not yourself a local. When I get off in a plane in a strange town, I don’t even know if my checked luggage arrived with me—I certainly can’t be expected to rattle off a list of all the decent barbecue joints within a five-mile radius of my hotel. But LocalEats can be expected to do precisely that. The iPhone app gathers up dining information from the Where the Locals Eat Web site to offer a handy guide to the top 100 restaurants in 50 major U.S. cities. Before you download LocalEats, it’s important to understand what the application does not do. This is not a social networking application where you can post your reviews and ratings of local eateries and read the opinions of other users (though there is a comment feature for each restaurant listing within LocalEats). For something like that, you’d be better off turning to a customer-review-focused app like Yelp. And while LocalEats does allow for some location-based searches, it’s not really a restaurant finder in the vein of Places, Where, or any other location-aware finder apps. LocalEats provides you with very specific reviews of very specific restaurants in very specific cities—and apart from one or two interface quibbles, it performs this task well. It’s an ideal choice for travelers who hunger for a solid reference guide to the dining scene in unfamiliar cities. Tapping on a restaurant name produces a detail age that shows a picture, usually of the restaurant’s interior, its address, and phone number. The Details page also notes the categories of food served, what meals the restaurant offers (breakfast, lunch, dinner), the price range, and other notable features. A Directions button takes you to the iPhone’s Maps application, with driving directions to the restaurant from your present location. 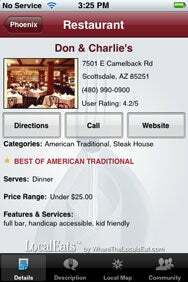 The Call button dials up the restaurant, while a tap of the Website button launches the Safair Web browser. Note that you have to touch the specific buttons to go to Maps or place a phone call—tapping the actual phone number or address won’t do the trick. Also note that once you go to Maps or Safari, you leave LocalEats behind, and that if you relaunch the app, you return to the start screen—not the Details page of the last restaurant you were browsing. I found that to be a little bit of a hassle. On the Menu: The details page gives you a thumbnail view of everything you need to know about a particular restaurant, along with links to driving directions and a way to call the restaurant directly. Besides the Details screen, buttons on the bottom of each restaurant listing let you navigate between a description of the restaurant, a local map, and a community page. Description usually features a page-long blurb about the restaurant’s offerings, atmosphere, and history, though in a few cases, you’ll find a generic description of how restaurants make the grade—a sign that the developer hasn’t gotten around to writing up a detailed review for every eatery just yet. The Local Map button uses a pinpoint to show where the selected restaurant is on a map without having to exit out of LocalEats to launch the Maps application (though there is a Launch Google Maps button for just that purpose). 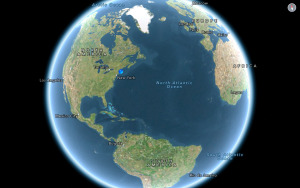 The Local Map screen has plus and minus buttons for zooming in and out, which is your only way to navigate the supplied screen—the pinch gestures that work so well in Maps won’t do anything here. The community page features the aforementioned user comments. There’s a button that allows you to submit a comment about your experience at a particular eatery; you can also e-mail information about that restaurant to friends (or even yourself). Comments are few and far between at this point, though they’re easy enough to submit. I sent one in about a restaurant in Phoenix I have a particular affinity for, and it was posted to the Community page for that restaurant within 24 hours. There are two other ways to track down restaurant listings through LocalEats. Near Me uses the iPhone’s location feature to produce a list of restaurants in the immediate vicinity. The closest restaurants are listed first—a particularly useful feature if you want to find a good place to eat that’s also nearby. 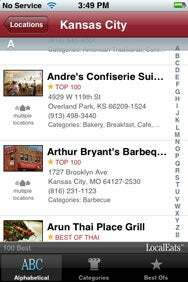 Near Address searches for eateries near an address, city, or zip that you type in, also listing the closest results first. Near Address stores your recent searches—how many, I can’t say, since I typed in 34 searches and they’re still accessible—giving you the ability to delete individual searches. While I appreciate the distance data that Near Me and Near Address searches produce, these two features have their limitations. First, there’s no way to get results by category—if you’ve got a hankering for Mexican food, you’ll still have to sort through all the steak houses, French bistros, and sushi providers to find your heart’s desire. Second, you’re still limited to the restaurant listing data for the 50 cities currently compiled for Local Eats. That’s great if you’re visiting some place like Austin, Texas (many, many listings), but not so hotso if you find yourself in Blacksburg, Virginia (zero listings). In its FAQ for its mobile app, Where the Locals Eat says its goal is to “cover the entire U.S. We are adding cities as fast as we can, but we admit we have a long way to go." LocalEats' value, then, is largely tied into whether you find yourself visiting the cities it covers. (The Where The Locals Eat Web site shows a complete list of the cities featured on the iPhone app.) In this calendar year, I’ve traveled to nine cities. LocalEats would have helped me track down grub in six of those locales: Los Angeles, San Diego, Austin, Kansas City, Pittsburgh, and the Washington D.C.-Norther Virginia metro area. It came up blank in the remaining three: Blacksburg, Fresno, and Vancouver. (Yes, LocalEats does not include any Canadian cities, and having consumed my own weight during a four-day stay in Vancouver, I can assure you that is a crying shame.) To me, six out of nine is enough to justify the $1 cost of the application; your travel plans may indicate otherwise. Me, I find LocalEats to be a handy addition to my travel gear—not just because it helps me find new places to explore, but because it helps me remember great places I’ve already eaten. A few years ago, I had the best crab cakes in the known universe at a restaurant just a few clicks away from the Baltimore-Washington International Airport—trouble was, I couldn’t remember the name of the establishment. Well, after tapping on Baltimore, then Categories, then Crab cakes, I was able to track down the G&M Restaurant & Lounge in beautiful Linthicum Heights, Md. A tool that can remind me where to find great crab cakes and help me avoid another bland meal at an interchangeable chain restaurant? Yeah, that’s earned a place on my iPhone. LocalEats is compatible with any iPhone or iPod touch running the iPhone 2.x software update.